A complicated question about making a form within a table that is accessible gets a great answer from Jared Smith at Web Standards Sherpa’s Facebook page. You read A List Apart without me having to remind you to, right? Nevertheless, I thought this customer services post called Designing for Services Beyond the Screen was really excellent. 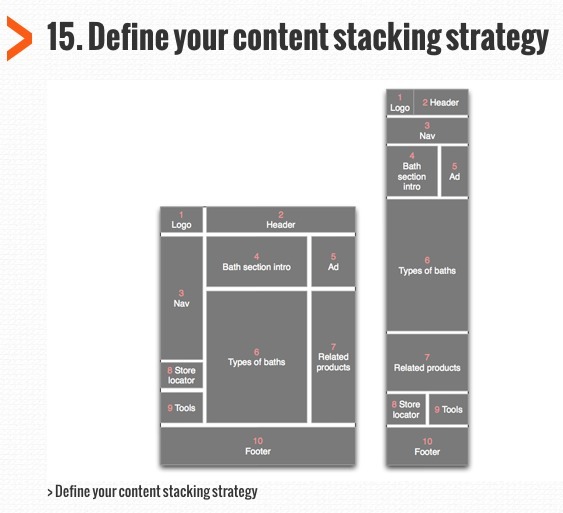 How can you take the lessons from this article and apply them to your site? Wow, talk about going mainstream. Ms. Magazine is getting into the fray on the topic of the miserable representation of women in gaming. Actually, About Half of Gamers are Women. It’s a good summary of the topic if you haven’t paid much attention before. Mobile Website Design: 30 Pro Tips at Creative Bloq makes some excellent points and has some graphics that look helpful to use in a classroom. This graphic, for example, in tip 15. In keeping with that wireframe image, take a look at this inspiring collection of wireframe sketches from various designers. UI & Wireframe Sketches for Your Inspiration. July 1 will be the end of Google Reader. Are you prepared? I’ve been using Netvibes after trying it out along with Feedly for a week long trial period. Netvibes won. Here’s a list of 12 alternatives to Google Reader. Just a reminder that there are links in the sidebar so that you can subscribe to the RSS feed for this blog using what ever reader you love the most. Atomic Web Design takes an interesting metaphorical look at how the bits and pieces (or atoms and molecules) of a web design work together. The Big Think: Breaking the Deliverables Habit is from Robert Hoekman at Smashing Magazine and is definitely worth thinking about. Not so long ago I wrote Shared Streaming: Good or Bad? Netflix has decided that shared streaming is happening whether they like it or not and is catering to it with Multiple User Profiles for Accounts. Is it just me, or does it seem that now that Steve Jobs is gone the Apple fanboys (and fangirls, may I add) feel free to poke jabs and complaints at Apple for various decisions regarding new products? It’s as if they are challenging Tim Cook to earn their affections all over again regardless of the quality of the products. The tweets during the recent announcements about iOS7 were often critical and bitchy – where has the unquestioned glowing enthusiasm gone? Was it all about Steve Jobs and not about Apple technology at all? Making Your Website Accessible, Part 1: Understanding WCAG is an interesting look at WCAG. In addition to explaining the basics of using WCAG, the author also discusses some of the drawbacks and problems. Here’s a video of Russ Weakley explaining the CSS NOT selector. IA in the touchscreen era. This is a long post, but I promise you’ll never be bored reading it. Chrissie Brodigan’s Blog is about UX and excellent. Take a look. Feel in need of a good giggle? Check out Laura Scott’s inspired post 7 Essential Elements to Create Amazing Top 7 Lists. Nice infographic about WordPress, with a bit a advertising for the source – Copyblogger – thrown in. The Copyblogger steps aren’t essential to the process, helpful as that website can be to a blogger. Google+ made some changes and upgrades last week and I thought it was time to take a second at this site, both to see what’s new and to discuss helpful features. Google announced the changes on the Google blog in Toward a Simpler, More Beautiful Google. A few of the other changes (you can get the full list in this video) are easier ways to join conversations, ways to track activity around conversations you’re following, and a page just for Hangouts. Some of the menu items pop out for more precise options, such as the Photo menu. The Profile page changed to include something that bears a whole lot of similarities to the Facebook Timeline, with a large image. Take a look at how She Geeks describes the Profile changes in Google Receives a Fresh Redesign that You Might Like. The redesign raised the hackles of developers whose apps broke, and engendered a mocking meme about whitespace. You can explore those issues in Google Introduces a Familiar Redesign and Google Angers Developer with Google+ Redesign. After several months using Google+ it remains way down on the list of social networks I check regularly. Perhaps I’m not following enough people to get the value I was hoping for from it, but I don’t find it especially important – yet. I think the Hangouts feature is terrific, but people I’d like to share a Hangout with (for example, my book discussion group) are not all on Google+. Even so, I’ve learned some tricks that help me get the most from Google+. They seem almost secret, because they are a bit hidden. If you take a second look at the site now to check out the new look, perhaps these tips will help you get more out of Google+. The first almost-secret is circle volume control. It’s a bit tricky to find. Start in your stream with the Home button. Then pull down the More menu and select a circle. I picked my circle called BlogHers. That will bring posts from BlogHers to the top of my stream. And, it brings up a volume control slider to the right of the page. Use the slider to determine the amount of volume as a percentage of your total stream you want to see from the chosen Circle. I find this really helpful. 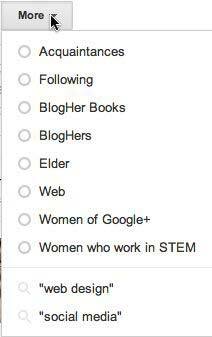 I recently added a circle called Women Who Work in STEM, and, wow, those women are talkative! I can turn the volume down on those posts, while getting more volume from my BlogHer circle. The second almost-secret is Sparks. A Spark is basically a saved search. I searched on the keywords “web design.” You see the results immediately, of course, but when the results appear, a button to “Save This Search” also appears. Click it and your search is saved. I saved another search, too. This one was for “social media.” Now, when I’m on the Home page looking at my stream, I can find both those searches in the More menu and check for new search results anytime. As with any change, reactions to new design are mixed. 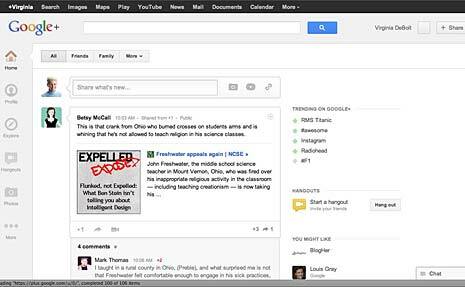 It’s interesting to use Google+ to search for “Google+ redesign” and see the mixed reactions. My personal reaction is, “Oh, Google+ changed.” What’s your response? Editor’s Note: All screen captures from Google+ by Virginia DeBolt. Cross-posted at BlogHer.